Children do not start wars, yet they are the most vulnerable to the deadly effect of wars. In Yemen, more than eleven million children are in need of humanitarian assistance. Instead of mailing any Season’s Greetings we have made a donation to help these children. We wish you all a peaceful year 2019. On 5 October 2018 Waselius & Wist is hosting a seminar in Helsinki on tax litigation, with specific focus on transfer pricing disputes. The seminar is part of a legal event called Käräjät, arranged by Edita Publishing Oy, one of the major producers of legal training in Finland. Waselius & Wist’s session will discuss the specific features of tax litigation at Court level. More particularly, the topics reflected in light of Court proceedings are inter alia transfer pricing and the specific features therein, alternative dispute resolution, display of evidence and the various economical methods as used in litigation for argumentation purposes. Certain State Aid cases will also be looked at as specific proceedings with a transfer pricing dimension as well as the Mutual Agreement Procedure as a means to solve cross-border conflicts. The session is chaired by our Tax partner Jouni Weckström. For more information and registration, please visit www.käräjät.fi (only available in Finnish). 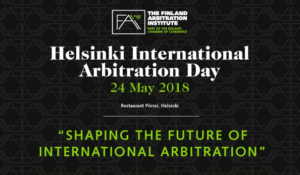 Waselius & Wist is sponsoring the upcoming Helsinki International Arbitration Day 2018, organized by The Arbitration Institute of the Finland Chamber of Commerce. The event will take place on 24th May 2018 at Restaurant Pörssi, Fabianinkatu 14, Helsinki, Finland . We look forward to meeting you there! 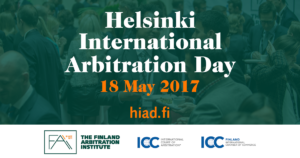 Waselius & Wist is sponsoring the upcoming Helsinki International Arbitration Day 2017, organized by The Arbitration Institute of the Finland Chamber of Commerce. The event will take place on 18th May 2017 at Finlandia Hall, Mannerheimintie 13 E, Helsinki, Finland. We look forward to meeting you there!